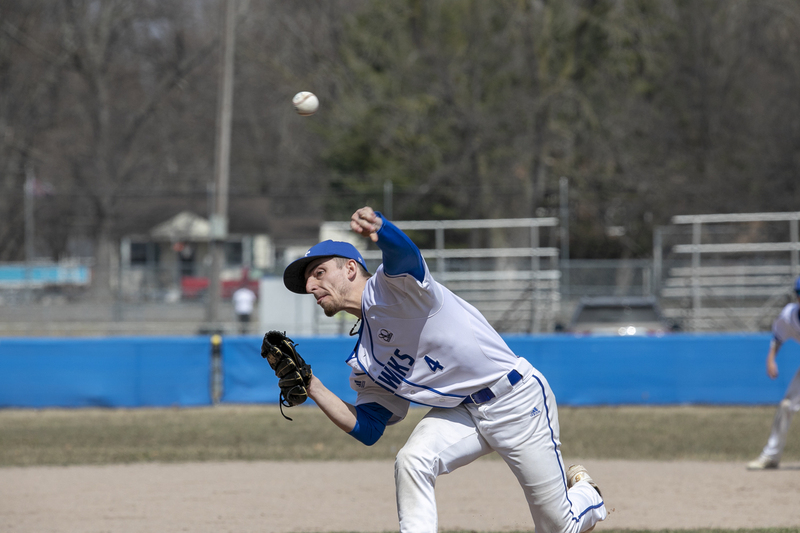 On April 6, the Henry Ford College Hawks men’s baseball team played a double-header against the Delta College Pioneers. Henry Ford lost 5-3 in the first game but prevailed 3-1 in the second. During the first game, one of the highlights was in the bottom of the fourth inning, down 4-2, Hawks Tristan Thompson’s single drove in Noah Wise to make the score 4-3. Jacob Hanoian made multiple defensive plays for the Hawks including a one-handed grab of a grounder to throw out the runner at first base. Jacob Way was the starting pitcher for the Hawks for the first game. After 6 innings, he allowed seven hits and five runs in the game. Way came into the game pitching 23.2 innings with a 6.85 ERA. Hawks Bobby Gorden came in as the relief pitcher and was able to get two quick outs to bring the game to the final half inning. For Delta College, Carson Longstreth was the starter and went all seven innings, ending with six strikeouts and two earned runs. The Hawks scored one run on an error. As the Hawks entered the first of the double-header, Duane Henderson led the team in hits, being 26 for 66. The Hawks Tristan Thompson went 2-3 at the plate. Delta college’s Jackson Lund and Lucas Sella both had two hits in the game. In the second game, Duane Henderson went 2-2 in the game. While Noah Wise hit 2-3. Garrett Gamble was the starting pitcher for the Hawks, coming in with a 2.91 ERA. Gamble went six innings and only allowed five hits and no runs. Cal Coaltrain came in the final inning to get the save, allowing only one run. This would be the first save of the year for the Hawks. For Delta College, Jackson Lund started and allowed three runs on seven hits. Connor Moe came in the fourth inning to finish the game. You can view more photos of the HFC vs. Delta game here. Contact Joshua Tufts: Jtufts@hawkmail.hfcc.edu. Follow him on Twitter @Joshua_Tufts.